With the Marvel Cinematic Universe being primed to be dramatically changed by both Black Panther and Avengers: Infinity War in 2018, we have now be gifted our first proper look at the sequel for Marvel’s smallest hero. Ant-Man and the Wasp follows the events of Captain America: Civil War (2016) with Paul Rudd’s Scott Lang on the run after being sprung from prison by good old Cap. Joining him on his journey is returning cast members Evangeline Lilly and Michael Douglas as Hope van Dyne and Hank Pym. We will also see the appearance of newcomers Laurence Fishburne as Dr. Bill Foster and Michelle Pfeiffer as Hope’s mother Janet van Dyne. Fans of the Marvel character have a lot to be excited for with the long overdue cinematic debut of the Wasp, who was one of the founding members of the Avengers in 1964. 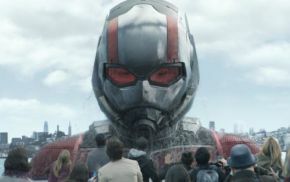 In the trailer we are given a quick glimpse at a number of big action sequences that show off Ant-Man and Wasp’s shrinking abilities including an insane car chase that will change the way you see PEZ, and suitcase buildings. We also get a brief glimpse at the return of Giant-Man, who made his show stopping debut in Captain America: Civil War. And we also get a brief look at Ant-Man's return to the Quantum Realm, which appeared towards the end of his first outing, to find and rescue Janet van Dyne. With Peyton Reed returning as director with a script from Paul Rudd, Spider-Man: Homecoming's Chris McKenna and Erik Sommers, Andrew Barrer and Gabriel Ferrari, it looks like Marvel have crafted another fantastic entry. Marvel’s Ant-Man and the Wasp will be released on 6th July 2018.